Eagle-Vail’s Mikaela Shiffrin just tends to win in big moments, whether it’s the Olympics (gold in slalom at Sochi in 2014), the world championships (two slalom golds, including on her home hill of Beaver Creek in 2015), or in front of big hometown crowds with even bigger expectations (Killington, Vermont on Sunday in the first World Cup slalom on the East Coast in 25 years). Shiffrin is both a New Englander (by virtue of her parents New Hampshire roots and attending Burke Mountain Academy) and a Coloradan (that aforementioned home in Eagle-Vail), so claiming a slalom win at Killington, in a race Aspen traditionally hosts but passed off due to the World Cup Finals there in March, was particularly sweet. 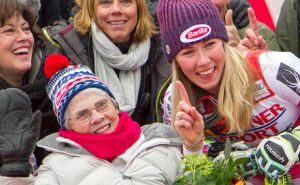 But the best part for Shiffrin was winning in front of her grandmother for the first time ever as her Nana made the races and was watching in the midst of a crowd of 16,000 rowdy race fans — the same number that attended Saturday’s giant slalom to watch Shiffrin ski to fifth place. Scoring points in GS has become fairly routine for Shiffrin, who was second in the season-opening GS in Soelden, Austria in October, but she still just has one World Cup GS win on her resume. Slalom is another story. She’s compiled 21 victories in that tech discipline, for an incredible career total of 22 wins at the age of 21. In fact, Shiffrin has won the last 10 World Cup slalom races she’s competed in. Mikaela Shiffrin and her Nana on Sunday (USSA photo). That includes two wins in Aspen last year — the first victories there by an American in three decades. That means Shiffrin will be a heavy favorite to win there again in March, when she may be chasing her first overall World Cup title as well. She currently leads those standings with 325 points to 168 for second-place Swiss skier Wendy Holdener. An overall title, which may also require her scoring some points in the speed event of super-G or in the super-combined, would be just the sixth ever for an American woman behind the U.S. record four overall titles won by Vail’s Lindsey Vonn and Tamara McKinney’s lone overall crown in the early 1980s. Vonn, 11 years older than Shiffrin, says she’s not done compiling records. Despite recently breaking her arm in training at Copper Mountain and likely missing two or three months of racing, the 32-year-old is eyeing the overall World Cup victory mark of 86 set by Swedish great Ingemar Stenmark. Vonn tops the women’s victory list with an astounding 76 wins. But consider this. Shiffrin is actually well ahead of Vonn’s victory pace. Vonn won her first World Cup race in 2004 at the age of 20. As a 21-year-old she had four World Cup wins to her name. Shiffrin has 22 career wins at age 21, and doesn’t turn 22 until March, so she can collect quite a few more before the Finals in Aspen. Vonn has averaged 5.4 victories a season since her debut in 2002, including an American record 12 wins during the 2012-13 World Cup season, while Shiffrin is averaging 3.6 wins per season in what’s now her sixth season on the circuit. The difference is Shiffrin started winning as a 16-year-old — basically four seasons before Vonn started climbing to the top step of podiums at the age of 20. If Shiffrin averages 3.6 wins a season until she’s Vonn’s age — a big if given the frequency of injuries in ski racing — she would wind up with 58 for her career — or third place on the all-time list. However, if Shiffrin continues to dominate her discipline the way she has the last two seasons (remember, she’s on a 10-race winning streak), she can come close to Vonn’s 12-win season record. There are 11 World Cup slalom races this season, ending with Aspen in March, and Shiffrin has already won two. So she could collect another 9 by the time she’s 22 in Aspen this March. Incredibly, Shiffrin is now tied for 19th on the all-time career victory list for women, and the only other active ski racer ahead of her on the list is the woman at the very top: Vonn. And while Vonn, a speed specialist, is chasing the men’s all-time record of 86 — held by the greatest slalom skier of all time, Stenmark — she’s also being chased by another slalom specialist who could someday claim the crown of all-time slalom queen currently held by Austria’s Malies Schild with 35 wins. And who knows, at this rate Shiffrin may one day eclipse Vonn’s all-time mark. Even if she “only” snags eight wins this season, Shiffrin would reach 30 for her career at an incredibly young age, tying her with retired legend Janica Kostelic for 10th on the all-time victory list. The key, of course, is staying healthy (a knee injury cost her most of last season) and staying motivated, which never seems to be a problem for Shiffrin. KILLINGTON, VT (Nov. 27, 2016) – In front of a huge hometown crowd and her entire family, Mikaela Shiffrin (Eagle-Vail, CO) shone under pressure to win the Audi FIS Ski World Cup slalom at Vermont’s Killington Mountain. Shiffrin’s win capped off a successful weekend in the east coast that will impact ski racing for decades to come. Coming in as the odds-on favorite, Shiffrin had a couple of small bobbles in her second run, but put aside all the pre-race pressure to extend her first-run lead and win by .73 seconds ahead of Veronika Velez Zuzulova of Slovakia to take her 21st World Cup win. Wendy Holdener of Switzerland was third. Next up, the women head to Lake Louise for a speed series Dec. 2-4. 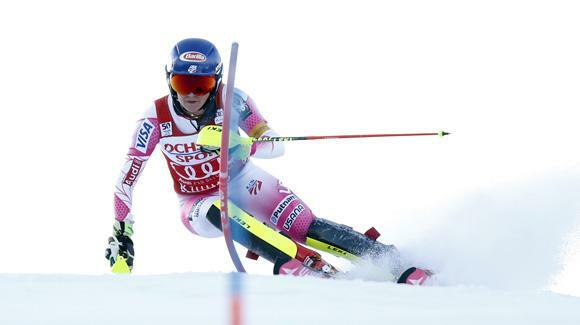 Mikaela Shiffrin won the Audi FIS Ski World Cup slalom at Killington Mountain by .73 seconds. Resi Stiegler (Jackson, WY) finished 17th. Lila Lapanja (Incline Village, NV), Megan McJames (Park City, UT) did not qualify for a second run. Nina O’Brien (Edwards, CO) and Patricia Mangan (Derby, NY)—who were racing their first slalom World Cup—did not finish first run. More than 30,000 people attended both races at Killington Mountain. Next, the women’s team heads to Lake Louise, Canada for a speed series Dec. 2-4. It’s been incredible. Racing in front of the east coast has been an emotional high for me. Then there’s been the pressure side of things—I put a lot of pressure on myself. I’ve been performing so well in slalom and I knew I had a great chance of winning the slalom here, coming into today. I woke up this morning, though, and I had a bad feeling about today. I went through a moment where I was thinking maybe I shouldn’t do this. I was so worked up and nervous and worried about the wrong thing. It wasn’t very enjoyable until the second run—the fight I put into the course and staying in the course even after making some bobbles here and there. I hope I looked like I wanted to ski fast because that was what my goal was. I’m still looking to put my best training skiing into a race. I think that role of being an inspiration for younger girls is growing. As more people tell me that I inspire them, I start to inspire myself more as well. I’m not the most confident person—I tend to have a lot of self-doubt, but I’m generally a really happy person. Sometimes these races get to me. I feel like I have to be something special or different or get someone else’s approval—the crowd, the media. Today, I tried to make the choice that I don’t need approval. That’s the message to these young girls that’s more important than my skiing. I ski for myself, not for anybody else. I work my tail off. Everybody does. All these girls are trying to beat me. But I’m not even close to my best skiing. I’m doing my thing and I’m a happy person. It’s great to be back here and get a breath of that freshness. A lot of my family was watching at World Champs at Vail/Beaver Creek, but my nana didn’t come to those. My entire family lives in the east coast. We had a big group of people here. I got to see them for Thanksgiving, which was incredible. They all say they had a good time—to be honest the fact that my nana was able to watch this race is amazing. I can’t put that into words. The proudest I’ve ever been is winning a race in front of my nana. The best part about it is that she doesn’t care whether I win or lose. She might not even remember! She doesn’t care—she loves me. Thanks nana for your unconditional love and your incredible pies. It was incredible. I heard there were 16,000 people up there yesterday. Especially in slalom, you can see the crowd from the start. Today you could peek over the break in the hill and see everybody. I could hear them in the start chanting “USA!” before my run. I love that. In these kinds of races, the crowd totally carries me down the hill. I knew it was going to be a big crowd. The tickets sold out in 24 hours back in the springtime. So people were so excited to watch us race. 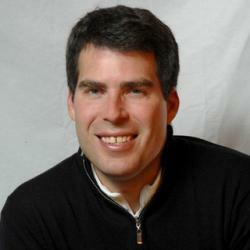 I knew it was going to be a big one, and special, and I was so excited. It’s the east coast, I know this place, I know these people love to watch ski racing. I’m so proud that they all came out and really cheered that loud!